Situated close to the edge of the highly sought after village of Olveston, this detached cottage in need of updating offers loads of potential (subject to relevant permissions). The accommodation currently comprises entrance hall, sitting room, dining room, kitchen and ground floor bathroom with 3 bedrooms and a walk in storage area on the first floor. But one of the main assets of the property are the lovely established southerly facing gardens which are full of different plants and shrubs and a fruit and vegetable plot, there are 2 outbuildings and a garage with parking for several vehicles in front. A detached cottage in need of updating offering loads of potential (subject to relevant permissions). 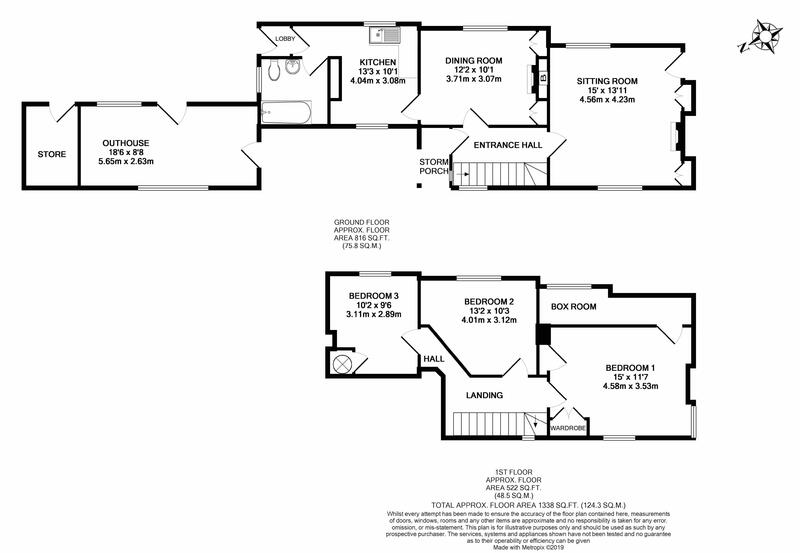 Comprising entrance hall, sitting room, dining room, kitchen and ground floor bathroom, 3 bedrooms and a walk in storage area on the first floor. Lovely established southerly facing gardens which are full of different plants and shrubs and a fruit and vegetable plot, 2 outbuildings and a garage with parking for several vehicles in front. These three villages, with a combined population of approximately 2000, remain amongst the most popular villages in our area. In Olveston, there are several village shops including a butcher, a baker and a general store and there are pubs in each of the villages. There is also a village school in Olveston as well as a highly regarded public school, Tockington Manor School, on the edge of Tockington. With stairs to the first floor, window to the front, glass panelled doors leading to the dining room and sitting room. Step down from the hall, triple aspect windows including door to the garden, open fireplace with tiled hearth and surround, two built in china cabinets, radiator and T.V. point. With wall and floor cabinets to two sides, laminated work surfaces over, single drainer sink unit, electric and gas cooker points, dual aspect windows, radiator, step up to the rear hall. Coloured suite with panelled bath with mixer shower attachment, low level W.C., pedestal wash hand basin, obscure glazed window, radiator. With half glazed door to the garden. With small window to the front and access to three bedrooms. Dual aspect windows, built in double wardrobe, further storage cupboard, door to large walk in storage area with window overlooking the garden. Stepped up from the landing and with window to the rear overlooking the garden, radiator. With airing cupboard housing hot water tank, recessed shelving, window to the rear and radiator. The cottage benefits from a lovely large garden, running along the full rear length of the property and then opening out at one end. A wealth of planting with shrubs, established herbaceous beds - a gardeners idyll. There is a greenhouse plus two outbuilding, one a good sized workshop with windows to two sides and a door out to the lane, the second a garden store. At the top end of the garden is a detached garage and workshop with double doors and personal access to the the rear. In front of the garage is parking for several vehicles. From our office, proceed up Alveston Hill and turn right opposite the Ship Hotel into Down Road. Follow this road all the way to the village of Olveston and on reaching the T junction at the bottom of the hill, turn right and drive through the village, turning right opposite the pub and church into Vicarage Lane. Oakdown, which is the last but one house on the right, can be found just around the rising bend on the right with the parking being at the top end of the property.